Hey, it’s been a while since the last article. The honest reason is that while I did read manga, I couldn’t find a set of three that I wanted to review, and time dragged on while I read… But ultimately, I found three that I figured I should discuss. One of them is this. Remember Chimoguri Ringo to Kingyobachi Otoko? Maybe you don’t, but one year ago it was among the first three manga I wrote about. So, I guess this is a celebration! Yay, one year anniversary! Anyway, this is another series by the same author, Abe Youichi (阿部洋一). It’s called Daidai wa, Hantoumei ni Nidonesuru (橙は、半透明に二度寝する) and as far as I know, the best way to translate this title is Daidai, Translucent it Goes Back to Sleep. 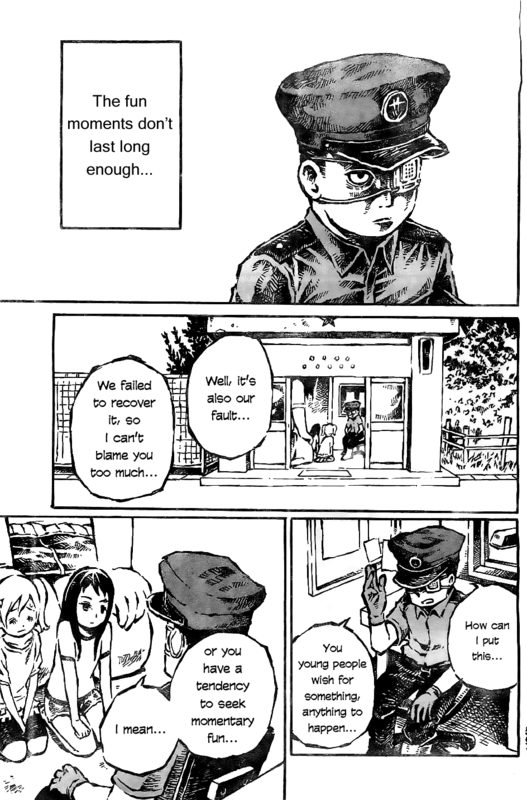 Note: “Daidai” seems to be the name of the manga’s setting, a town. It could also be “The Bitter Orange”, but that makes a lot less sense. This will likely be my shortest review because this series is very small and very reliant on ignoring your expectations. Basically, if you like Chimoguri Ringo, Hoshi no Ponko to Toufuya Reiko, Nickelodeon, and/or Sora ga Haiiro Dakara, you will like Daidai wa, Hantoumei ni Nidonesuru. Also if you like Dowman Sayman, who seems similar to Abe Youichi. This is a surreal black comedy tragedy featuring a small town which we see through interconnected one shots. It has amazing art and is very weird and there’s a lot of focus on water/the sea/ocean life. Interested? That is a disembodied head, yes. The series takes place in some town. 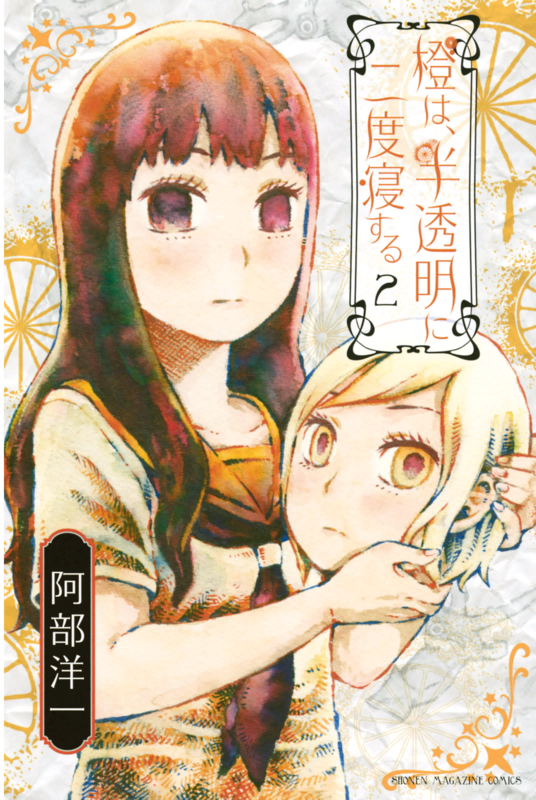 The first chapter is about a girl who murders and decapitates her best friend because said friend suddenly started being mean and cold. Don’t worry, they make up. 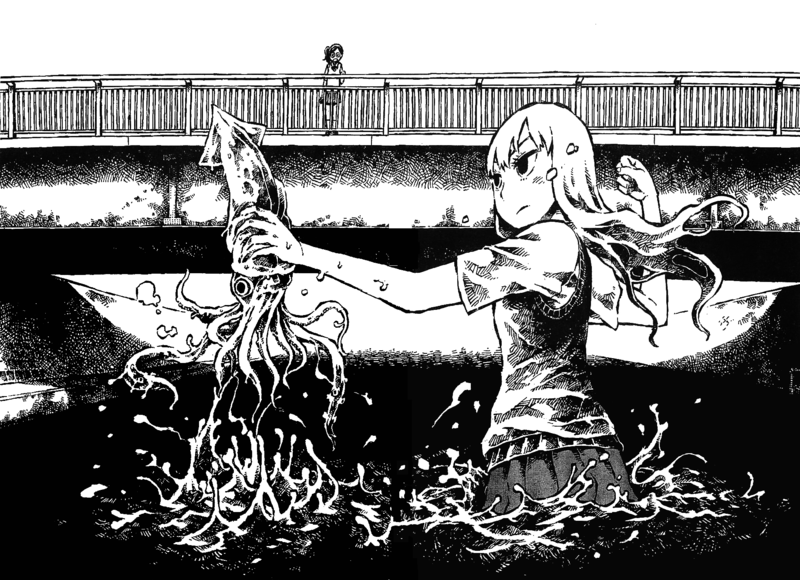 The closest thing to a plot is that a homeless young girl wanderer is killing alien invaders that look exactly like fish. Or, she says they’re alien invaders. Nobody believes her, but she continues to fight. Also, there’s this cop who’s sick and tired of the kids in his town. They keep doing dumb stuff and getting into trouble or danger and they pretend the town is weird and man, he sure can’t stand it. There’s no reason to believe the town is strange. So basically, highly recommended, one of my favorites. 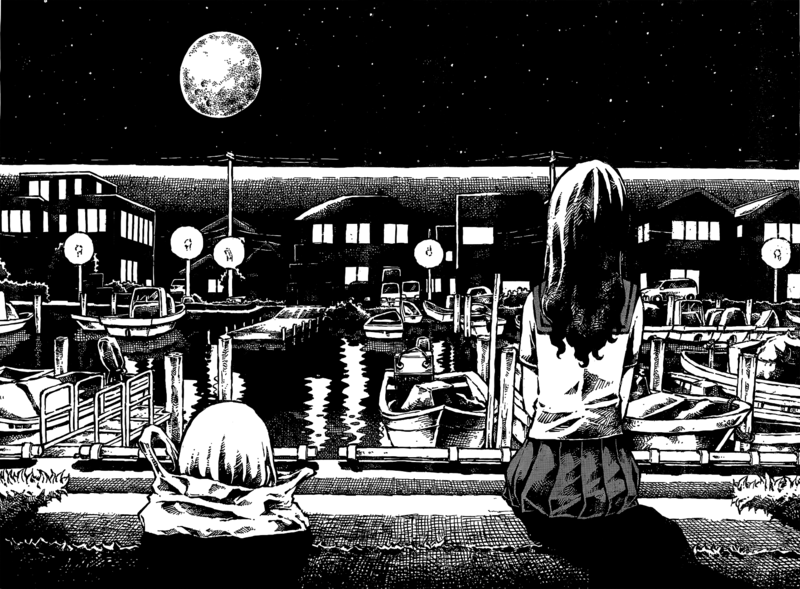 Daidai wa, Hantoumei ni Nidonesuru is an incredibly good, incredibly unique series full of wonderful and more than occasionally sad things. It can be pretty funny or tragic, and every story inside its two volumes is good. Probably the greatest thing about it, and Abe Youichi’s manga in general, is about how just about any single page of it could sell it. Chimoguri is the same way. The translation is complete, and…woof that final chapter. Anyway, it’s great stuff. Your most likely expression while reading this manga. You may purchase Daidai wa, Hantoumei ni Nidonesuru from Bookwalker (guide), ebookjapan, CDJapan, or honto (guide). Please do! Thanks for reading! 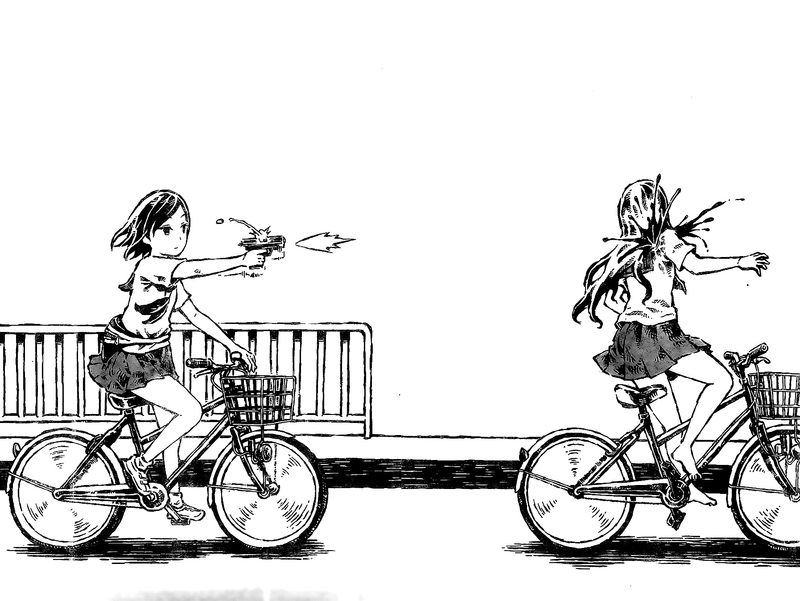 Next time, a yuri manga? It’s yuri, right? > The first chapter is about a girl who murders and decapitates her best friend because said friend suddenly started being mean and cold. Don’t worry, they make up. This makes the third time I’m plugging a series or two your way (I’m starting to feel guilty about it :p), but if you’re short on material I might have a couple – Demi-chan wa Kataritai, where a teacher who is (mostly innocently) interested in learning about demi-humans has three, plus another teacher, appear at the school he works at, and Kishuku Gakkou No Juliet, which has been making a splash in the Kaguya Wants to be Confessed To crossovers recently. Both are fairly relaxed, comfy titles I think worth your time. Dang, I keep forgetting that italics tags don’t work like that here, and I have no idea how to edit (if that’s even possible). xD Anywho, maybe the third is worth a follow all the same? Visitors can’t edit the comments. I can, though, so I gave you proper italics. Seems like the comments just use html so, if I’m correct this should be italicized. That’s em /em where the ems are in between a less than and greater than symbol. Anyway, I wouldn’t actually say I’m short on material, but rather my picks didn’t work out well this time. So goes it with my whimsical means of choosing manga. I started reading a longer series, but since it was long I put it down and thought to work on shorter series instead while reading the longer one over a…well, longer period of time, but the shorter ones I chose to try reading didn’t really strike my fancy for the most part. So I had to hem and haw over which series I could write about this time. Anyway, I don’t mind getting recommendations. Not at all. That said, Demi-chan was a series I glanced at last year and wrote off. 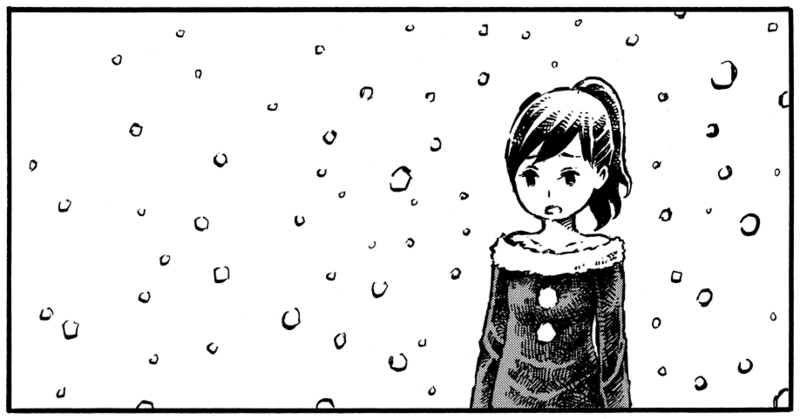 One of those times where I just give a series brief look and judge it very quickly without giving it a proper chance (there are many of these times; despite how many “favorite” manga I read and how much praise I dole out I can TOTALLY be negative). That’s definitely not to say it’s bad, since I obviously can’t judge at all. I may give it another shot, but I recall not being fond of the main character or the premise. Kishuku Gakkou No Juliet is something I paged through and wasn’t sure about. It didn’t turn me off like Demi-chan, but it didn’t grab me either. 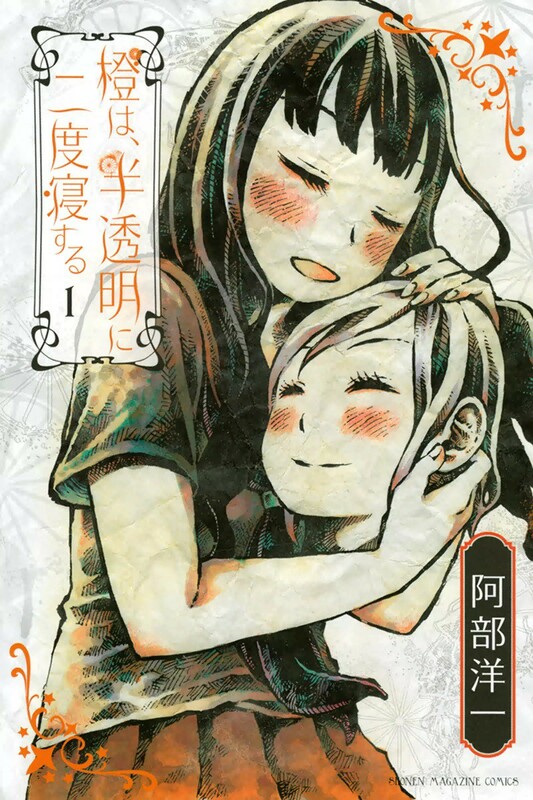 I can’t review Elf-san wa Yaserarenai, because it’s too young (my rule is that the series needs to have 1 volume at least, and if not that it has to have ran for a while). That said I have heard of it and was planning on giving it a look. I like the character designs, but I DON’T really like the look of that main character. I only have the series bookmarked and have only seen a few pages though. Ahh, thanks for the tip.Just goes to show I’m a tad too used to BBCode. And thanks on Daidai (since I hadn’t said so previously)! I can see what you mean about choices, though, as I’d imagine how easy it is to present a title varies from case to case, even without factoring how well it caters to taste. On that note, no worries about Elf-san; again, three chapters and a so-far monthly release is hardly much to work with, And I know what ya mean with the main character, who’s mostly just…there. Things could go either way thus far, but of course I’m hoping it works out on the same level as Danberu has. As for Demi-chan and Kishuku Gakkou No Juliet, ah well, it was worth a shot. Not a whole lot to say about the latter, due to the premise being its chief strength (and Hazuki, but that’s a whole other story) in my opinion. 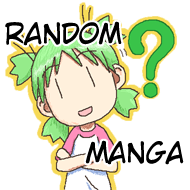 In Demi-chan’s case, the manga feels at its strongest whenever the Dullahan, Machi, becomes the chapter’s focus, which she has recently, much to my personal joy. Chapters with the Yuki-Onna are nice, too, but there’s not as many of them. And as for Himari (the vampire)…well, I don’t hate her, but it’s mostly where her sister comes in that she seems at her best. I think one of the nice things about Demi-chan is, despite having seen similar premises – a high school series involving romance (one-sided thus far, thankfully) and monster girls – the teacher isn’t really a main character type I see much of, which makes for decent interaction, and the overall tone has been very laid back, and I’m a real sucker for that. Glad to hear you’re not averse to recommendations though; I constantly worry if other folks are doing the same en masse. xD Of course, rather than spamming your blog with ’em, would PMs via Batoto be acceptable? My initial turnoff with Demi-chan was “this feels like a harem series”, and while I do read a few of those, it really is a few and I tend to be biased against the genre. It seems like my impression was wrong, though? One sided romance is probably fine. I’ll have to give it another chance some time. And actually, I’d rather get recommendations on here than in PMs, reason being other people can see the recommendations and pick something else up for themselves. That said, I don’t mind getting PMs, I just think having reccs in the comments is probably something else you could consider useful for readers of the site (for instance, I was recommended Cirque Arache on the directory and did read it, but didn’t like it and thus didn’t review it (though I did leave a reply); someone reading the comments might like the series though). Yeah, Demi-chan isn’t really harem-y at all. Of the two girls who actually do crush on the teacher, one is the aforementioned one-sided romance (and, amazingly, it’s not even Himari), whilst the other, a succubus and a fellow teacher, actually makes for an interesting perspective on how one’s power affects them on a daily basis. Both cases, and those characters in general, are handled quite well, I think. And gotcha on the recommendations, I hadn’t thought of it that way. Thank you for reviewing this manga. I love it so much! 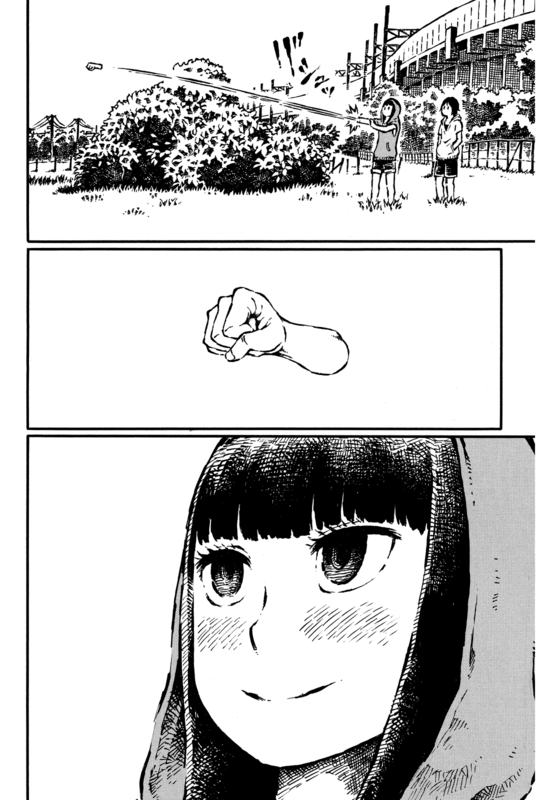 Somehow this manga reminds me of Nichijou, lol… But, why is this do short? Just when i learnt to love it, it ended already. Give me another chapter!!! Check out the author’s other manga. It’s all quite similar in style. Anyway, you’re welcome, happy you loved it!